Disinfectants are highly effective, universally applicable products on the basis of benzalkonium chloride and an organotin compound. Owing to the synergetic effect, the combination of both main components results in the enhancement of their individual properties. 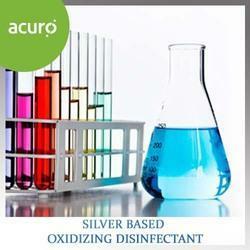 CHEMIKASAN® Disinfectants are perfectly suited to the disinfection of surfaces and contents. 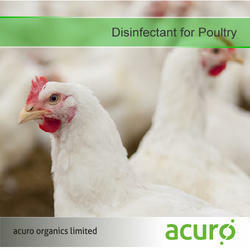 In either case there are no gaps in effectiveness and no danger of bacterial resistance. Apart from being neutral as far as smell and taste are concerned, long-term effectiveness, environment friendliness and easy handling further characterize the products. The CHEMIKASAN® Disinfection Concept is completed by a wide range of selected and tested measuring, dosing, and spraying equipment, thereby offering a user-friendly, well developed and complete disinfection solution. 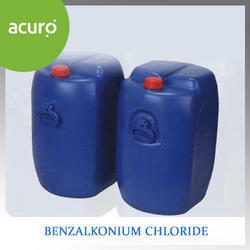 Alternative cas no for Benzalkonium Chloride (BKC) : 8001-54-5 un no:1760. Chemikasil is an eco-friendly, multi-component oxidising biocide scientifically formulated using a stable combination of hydrogen peroxide (H2O2) and silver (Ag) ions to create a highly effective sanitising solution. This synergistic combination between the hydrogen peroxide and silver is so effective that it creates a biocide twenty times more powerful than that of hydrogen peroxide alone.Chemikasil represents a new generation of clean, safe, environmentally friendly biocides for the effective control of micro-pathogens including Legionella, E.Coli, Influenza A and B, Pseudomonas, Campylobacter, Salmonella, MRSA, VRE and other bacterial, viral and fungal infections, on hard surfaces and in water systems. Chemikasil , being a highly effective super sanitiser, its applications are numerous making it ideal for use in hospitals, veterinary surgeries, food production facilities, farms, hotels, industrial and office buildings, schools, swimming pools and spa's.Chemikasil also offers a unique and complete bio-security solution for poultry, fruit and vegetable, beverage and meat and fish production. Chemikasil is a high performance, broad spectrum biocide based on an innovative formulation of hydrogen peroxide (H2O2) and silver (Ag). Chemikasil is effective against all kinds of bacteria, viruses, yeasts, moulds and spore formers. It is also very effective against Legionella pneumophila, the causative organism for Legionnaires’ disease. 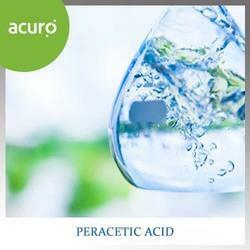 Peracetic acid(also known as peroxyacetic acid, or PAA), is an organic compound with the formula CH3CO3H. This organic peroxide is a colorless liquid with a characteristic acrid odor reminiscent of acetic acid. 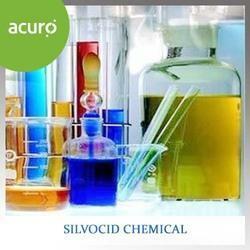 It can be highly corrosive.The main use of peracetic acid is for the industrial synthesis of epoxides. It transfers an oxygen atom to double bonds, e.g. in ethene and propene, to formepoxides and alcohols. 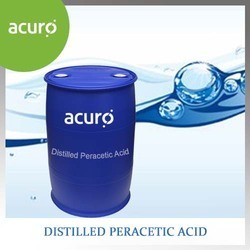 It can also be used in producing synthetic glycero from propene, and is used in nylon manufacturing.Peracetic acid is used mainly in the food industry, where it is applied as a cleanser and as adisinfectant. Since the early 1950’s, acetic acid was applied for bacteria and fungi removal from fruits and vegetables. It was also used for the disinfection of recicled rinsing water for foodstuffs.Nowadays peracetic acid is applied for the disinfection of medical supplies and to prevent bio film formation in pulp industries. It can be applied during water purification as a disinfectant and for plumming disinfection.Peracetic acid is suitable for cooling tower water disinfection; it affectively prevents bio film formation and Controls Legionella bacteria. 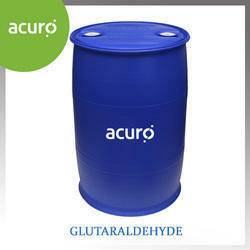 Glutaraldehyde is a chemical frequently used as a disinfectant and sterilizing agent against bacteria and viruses (2% solution), an embalming fluid and tissue fixative, a component of leather tanning solutions, and an intermediate in the production of certain sealants, resins, dyes, and electrical products. 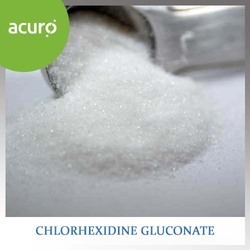 Glutaraldehyde is used in agricultural chemicals, pesticide products, disinfectants (nonagricultural), furniture polish and cleaners, laundry starch preparations, leather industry in tanning process. » Clear, colourless liquid with acrid odour. » Freely soluble in water and alcohol. 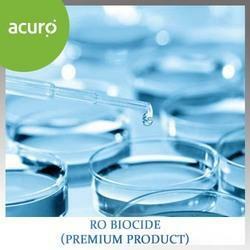 ACUROSIL IB is a broad spectrum, fast acting bactericide for the formulation of disinfectants and sanitisers, for use in industrial, institutional, agricultural, food, beverage and domestic applications.ACUROSIL IB is a 20% aqueous solution of poly (hexamethylene biguanide) hydrodhloride, also known as PHMB. ACUROSIL IB can be used alone or in combination with other biocides to create products for a wide range of disinfection applications. Considerable data exists which provides a measure of the intrinsic anti-microbial activity of ACUROSIL IB, generated via European suspension test protocols relevant to application in Food, Industrial, Domestic and Institutional Hygiene. Chlorhexidine is a cationic polybiguanide (bisbiguanide). 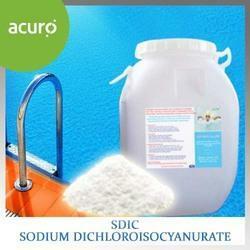 It is used primarily as its salts (e.g., the dihydrochloride, diacetate and digluconate). Chlorhexidine is used in disinfectants (disinfection of the skin and hands), cosmetics (additive to creams, toothpaste, deodorants, and antiperspirants), and pharmaceutical products (preservative in eye drops, active substance in wound dressings and antiseptic mouthwashes).For use in animals, it is used as a topical disinfectant of wounds.Chlorhexidine gluconate is used as a skin cleanser for surgical scrub, cleanser for skin wounds, preoperative skin preparation and germicidal hand rinse.Chlorhexidine is often used as an active ingredient in mouthwash designed to reducedental plaque and oral bacteria. Chemika offer a range of high performance chlorine tablets that have been developed to offer a fast dissolving, convenient, safer and more accurate disinfection alternative to liquid bleach.Chemika's chlorine tablets are specially formulated using a dry chlorine donor, sodium dichloroisocyanurate (NaDCC) which is carefully blended with reliable effervescent components to create a highly effective disinfectant product in a convenient, easy to use tablet form.Chemika chlorine tablets are a safer, more effective, economic and convenient disinfectant. They are fast acting and have a complete spectrum of biocidal activity, being effective against virtually all known bacteria, bacterial spores, algae, fungi, protozoa and viruses. 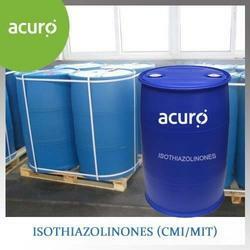 Isothiazolinones is composed of 5-chloro-2-methyl-4-thiazoline-3-ketone (CMI) and 2-methyl-4-thiazoline-3-ketone (MI). The bactericidal effect of isothiazolinones is carried out through breaking the bond between bacteria and algae protein. When contacted with microbes, isothiazolinones can quickly inhibit their growth, thus leading to death of these microbes. Isothiazolinones has strong inhibition and biocidal effects on ordinary bacteria, fungi and alga, and has many advantages such as high biocidal efficiency, good degradation, no residual, safety in operation, good compatibleness, good stabilization, low cost in operation. Isothiazolinones can mix with chlorine and most cation, anion, and non-ionic surfactants. When used at high dosage, its dislodge stripping effect is excellent. Isothiazolinones is a kind of fungicidal with properties of broad spectrum, high efficiency, low toxicity and non-oxidative, it is the ideal biocidal in industrial circulating cool water system and in waste water treatment in oilfield, paper making, pesticide, cutting oil, leather, detergent and cosmetics etc. Isothiazolinones (CMI/MIT) is composed of 5-chloro-2-methyl-4-thiazoline-3-ketone (CMI) and 2-methyl-4-thiazoline-3-ketone (MIT). The bactericidal effect of isothiazolinones is carried out through breaking the bond between bacteria and algae protein. When contacted with microbes, isothiazolinones can quickly inhibit their growth, thus leading to death of these microbes. Triclosan is an antibacterial and antifungal agent. It is a polychloro phenoxy phenol. It is a white powdered solid with a slight aromatic/phenolic odor. It is a chlorinated aromatic compound that has functional groups representative of both ethersand phenols. Phenols often show antibacterial properties. Triclosan is only slightly soluble in water, but soluble in ethanol, methanol, diethyl ether, and strongly basic solutions. 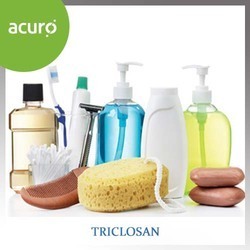 Triclosan is present in soaps (0.10-1.00%), deodorants, toothpastes, mouth washes, and cleaning supplies, and is incorporated into an increasing number of consumer products, such as kitchen utensils, toys, bedding, socks, and trash bags. Its also found in the health care setting in surgical scrubs and personnel handwashes. Triclosan has been shown to be effective in reducing and controlling bacterial contamination on the hands and on treated products. Triclosan is used mainly in antiperspirants/deodorants, cleansers, and hand sanitizers as a preservative and an anti-bacterial agent. In addition to cosmetics, triclosan is also used as an antibacterial agent in laundry detergent, facial tissues, and antiseptics for wounds, as well as a preservative to resist bacteria, fungus, mildew and odors in other household products that are sometimes advertized as "anti-bacterial." These products include garbage bags, toys, linens, mattresses, toilet fixtures, clothing, furniture fabric, and paints. Triclosan also has medical applications. Triclosan also has been employed as an effective selective agent in molecular cloning. 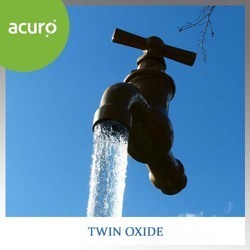 Twinoxide is a unique and advanced delivery system, providing 99.9% pure chlorine dioxide solution in a 0.3% concentration without by-products. It is applied as a (drinking) water disinfectant. TwinOxide is delivered as a powder kit of two components. Once added to a specific volume of water, TwinOxide® reacts to a 99.9x% pure chlorine dioxide solution with a kinetic halftime as a biocide of 30 days. As water contamination levels vary, it is easily possible to vary the dosage rate of TwinOxide®. 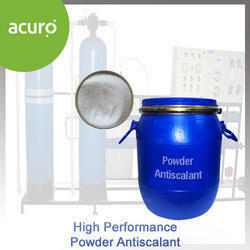 We are the premium Twinoxide Chemical Suppliers in India. 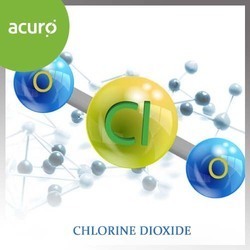 Chlorine dioxide is an environmentally friendly oxidant that is preferred by many regulating water utilities and supply authorities for final discharge disinfection. 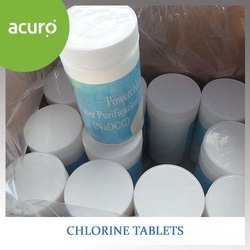 Chlorine dioxide controls bacteria such as E. coli and other coliforms. It does not accumulate in the environment and can be used to reduce the growth of troublesome biofilms, iron bacteria, algae and other organisms known to contribute to wastewater and effluent fouling problems. Chlorine dioxide can also help reduce effluent surcharges and regulatory fines by reducing Biological Oxygen Demand (BOD) in wastewater without producing chlorinated by-products such as THM and HAA.It is also an excellent odour neutraliser, helping to control secondary and tertiary amines. It is a powder antiscalant and stabilizer controls inorganic scale, metals and colloids in RO feedwaters, reducing membrane fouling tendencies and minimizing membrane cleaning requirements. 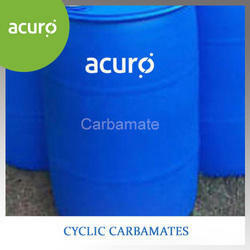 It is compatible with all membrane types and system components, ensuring product reliability.As a powder, it reduces shipping weight by 96% and shrinks storage space requirements by 95% compared to liquids.it is easily mixed into solution and maintains performance integrity at extreme pH levels and temperatures. Being stable in the presence of multivalent ions such as iron, this product will not precipitate, crystallize, or blind the membrane at high concentrations. Therefore, accidental overdosing will not adversely affect system components or membranes. 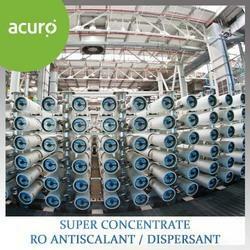 It is a high performance chemical pretreatment that controls inorganic salts, metal hydroxides, and colloids in RO feedwater. Its unique performance characteristics provide users with more complete control of system feed water chemistry, reducing membrane fouling and minimizing cleaning requirements. It is compatible with all membrane types and system components. 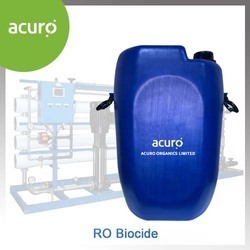 Biofouling is inevitable in every membrane system; however, using RO BIOCIDE™ you can minimize the impact of biogrowth on the operation of your RO system. 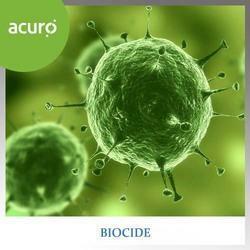 The right biocide program can reduce your need for membrane cleaning, reducing your overall cost of operation. ACURO's RO BIOCIDE™ are membrane safe and can be used online or offline. 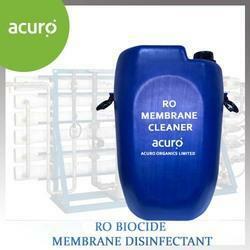 RO BIOCIDE™ is a blend of high performance non-oxidizing biocides, helps in keeping away biofouling and formation of biofilms in the membrane. It is safe and biodegradable biocide which is effective against wide spectrum micro-organisms & requires low dosage level for accelerated response followed by gradual action for effective removal of algae, fungi and bacteria. Biofouling of RO membrane can result in various severe problems such as poor and contaminated permeate quality, reduced flow rate, increase in power and reduced productivity. 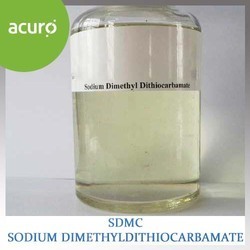 ACURO's Sodium Dimethyldithiocarbamate is a white to off-white crystalline powder. Used as a disinfectant, corrosion inhibitor, coagulant, vulcanizing agent, chelating agent, fungicide, and biocide (paints, cutting oils, water treatment, leather tanning, and paper manufacturing). It is a high performance chemical pretreatment that controls inorganic salts, metal hydroxides, and colloids in RO feedwater. Its unique performance characteristics provide users with more complete control of system feed water chemistry, reducing membrane fouling and minimizing cleaning requirements. RADOX C20 is compatible with all membrane types and system components.